Mobigame, developer and publisher of some top rated iPhone and iPad games, has begun a week-long sale of some of it’s best titles. 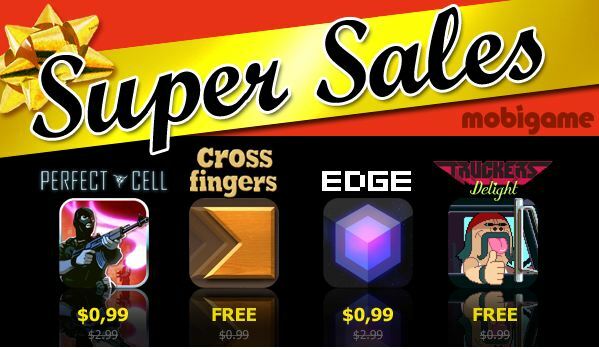 The games on sale are Edge, Cross Fingers, Truckers Delight and Perfect Cell. Edge is a classic iPhone game that has recently been updated with a cool progressive sync feature between the iPad and iPhone and new super smooth 60 fps gameplay. Truckers Delight is a great racing/action hybrid with the emphasis very much on humour, Perfect Cell is an excellent action stealth title that we loved enough to give it an impressive 91% in our review, and Cross Fingers is a puzzle game that also scored highly, earing 90% in our review. The great news is that you can pick up ALL of these games for a grand total of $1.98. Think of it as a great little collection, as each of these are easily worth that amount alone. Remember the prices will only be this cheap for a week so don’t delay.